When exploring Hollywood, there are plenty of things to do year round such as learning interesting hollywood walk of fame facts. 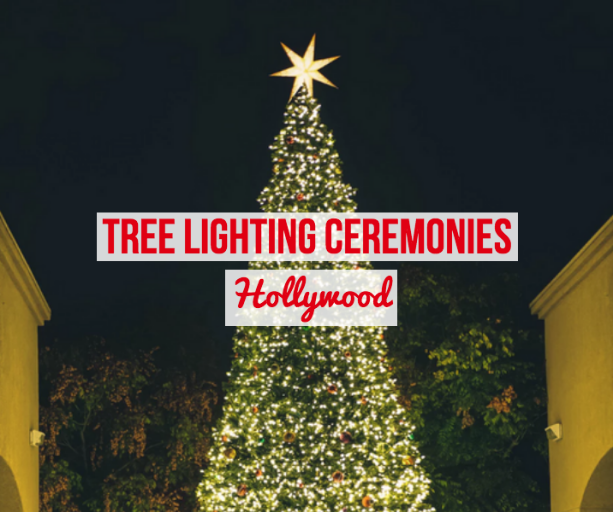 If you happen to be in the area during the Holiday season and are looking for Hollywood tree lighting events, check out some of these nearby events! Located in the heart of Downtown Los Angeles, you’ll find Grand Park, a communal green space in the city that hosts a number of different free events throughout the year. One such event is the Los Angeles County Tree Lighting. During this annual tree lighting ceremony, the community gathers together to celebrate the holiday spirit. At the event, there will be performances by local music artists as well as community groups. The tree lighting ceremony will take place on November 26th and this is a FREE event. The Grove is a popular outdoor shopping and entertainment destination. From shops and restaurants to a movie theater, there are plenty of things to enjoy. One upcoming event is the 17th Annual Tree Lighting celebration to kick off your holiday season. Not only will this event feature a lighting of a stunning Christmas tree, it will also include performances from CBS A Home for the Holidays, including Andy Grammer, Daya, JD McCrary, Lindsey Stirling and more! Stay afterward for a magical snowfall, a fireworks show and of course, Santa’s grand arrival! This event will take place on November 18th from 7:30pm until 9pm and will kick of the holiday season at The Grove. Additionally, snow will fall every evening from November 19th through December 25th at 7 and 8pm. Located in Glendale, CA, the Americana is one of the best outdoor shopping destinations around. Every year, this outdoor mall goes above and beyond for their Christmas celebrations. In fact, no matter your age, you’ll be sure to be swept up in the holiday decor and cheer. Throughout the event, there will be live entertainment, dance performances, fireworks, and snow flurries all leading up to the big event - the arrival of Santa Claus and the lighting of the 100 foot tall Christmas tree!